The winemaking “avant garde” (for want of a better word) in South Africa is one of the strongest in the world, and there’s no doubt that one of the reasons for its continued joyful growth is the solidarity and mutual support of the many young winemakers involved. There’s no jealous guarding of grapes, of secrets, or marketing and winemaking tips. They help each other more than compete. It’s reminiscent, to an extent, of the origins of the Cape Independent Winemakers Guild, when a bunch of winemakers got together to pool their understanding and experience in order to compete with the richer, much better resourced big merchants (a rather different scenario from that of the current CWG). As with the other aspects of Cape avant-gardism, the vital originating moves of winemaker mutual support began in the Swartland. 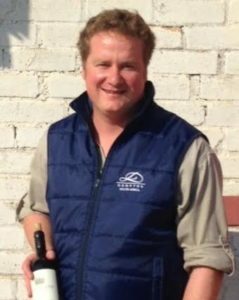 From the start, once he’d set out on his own, Eben Sadie was welcoming and encouraging of others – in the early days, for example, of Tom Lubbe (now in France), of someone like Chris Mullineux inspired to make a Swartland wine at Tulbagh Mountain Vineyards, of Adi Badenhorst – like the Mullineux, soon to set up his own Swartland enterprise. The Swartland winemaking revolution was made into an exciting, thriving and vital thing through the working together of all those who chose to commit themselves to this thing that was both a home for themselves and also much larger than themselves. The winemakers there continue to give each other whatever support they can. From what I’ve seen, offers of help are easily made, requests for it never refused. This attitude has spread widely through the winelands. I’ve written before about one example of it, the little “centre of excellence” at Gabrielskloof, where Peter-Allan Finlayson hosts a handful of young winemakers, taking further the experience of practical solidarity he’d had when working with Chris Alheit (and latterly John Seccombe) in shared space in the Hemel-en-Aarde. And Peter-Allan has told me something of the sharing attitude of those who established the best traditions of the modern Swartland. “Pretty much every young winemaker who has started their own brand in South Africa in the last 10 years has worked with Eben Sadie”, he says. A crucial reason for Sadie’s influence has been, in fact, his willingness to help where he can; and this generosity of spirit has been taken up and gone wide and deep. Don’t underestimate its influence on the wine in your glass. The wine just has to be good. Fortunately it is. Delighted you managed to meet Lukas. Exciting stuff. Can’t wait to taste what I saw in barrel committed to the bottle later this year. My son, Sebastian, is a second year BSC Oenology student at Stellies and we have been blown away by the wine making community and how incredibly generous they have been to share their experience and knowledge with a young man eager to learn.Without exception every winemaker he has approached has opened their doors and been so happy to share. Thank you to all of you.